Comments: This is Dan's second album since he released his debut album Waiting For Inspiration 2 years ago. "Miles From Dublin" is mostly traditional Irish tunes, with few from New Brunswick, some traditional American, a couple hymns and 3 originals. This is a self-produced project (released through his own label: CeltoGrass Records) primarily featuring the work of acoustic guitarist Dan Carollo. The CD has a guitar-driven feel throughout, with Dan shifting between melodic riffs and backup rhythm. Joining Dan are several outstanding guest musicians: Eliot Grasso on uilleann pipes and flute, Randal Bays on fiddle, Suzanne Taylor on accordion and Michael Connolly on mandolin. Write about Miles From Dublin! 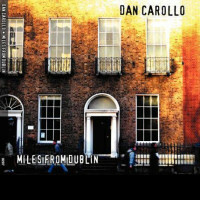 Want to write a review about Dan Carollo's Miles From Dublin album? Post your comments in this box to be displayed in our community forums and in our album database! Please make sure you are logged in before proceeding. Please login to write your comments about Miles From Dublin.